The three-bar hilt comprises a knuckle-guard which continues into a rear quillon with disc terminal inclined towards the blade; and two loop-guards, outside the hand, join the knuckle-guard to the cross, at points just behind and forward of the grip. Inside the hand is a single loop-guard, at a right angle to the plane of the blade. 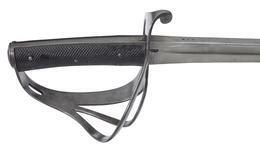 The grip is formed to two thick leather scales, attached to the full-width (Reeve's patent) tang by five rivets. The minimally curved single-edged blade has a spear point, a long false edge and fuller which rises near the hilt and extends for about five sevenths of its length. The steel scabbard has a mouthpiece secured by two screws, and asymmetrical shoe, and two raised bands each supporting a loose suspension ring.